I recently ordered this dress for a photo shoot that I was asked to be part of. Sadly, because of the holidays and the extra cold weather, it was delayed in shipping. This left me in a bit of a panic and I ultimately dashed out the night before the shoot and found a back-up dress for under $50. I ended up loving my back-up dress, and the photos from that shoot turned out amazing, so I was on a bit of a high this day. On my way home I decided to call my girlfriend and ask her to watch my kids for a few hours because my hair and makeup looked way too good for me not to go on a date this night. (Thank you again Gwen!) Now, back to this emerald lace dress. I kid you not, it showed up on my doorstep one hour after I got home from said photo shoot. My original plan was to return it. After all, it's sole purpose was to be for this shoot and the dress missed it. However, I was about to go on a date and after trying it on, there was no way this beauty was going back! I love the color pairing of emerald and plum so much. They really are a color match made in heaven! 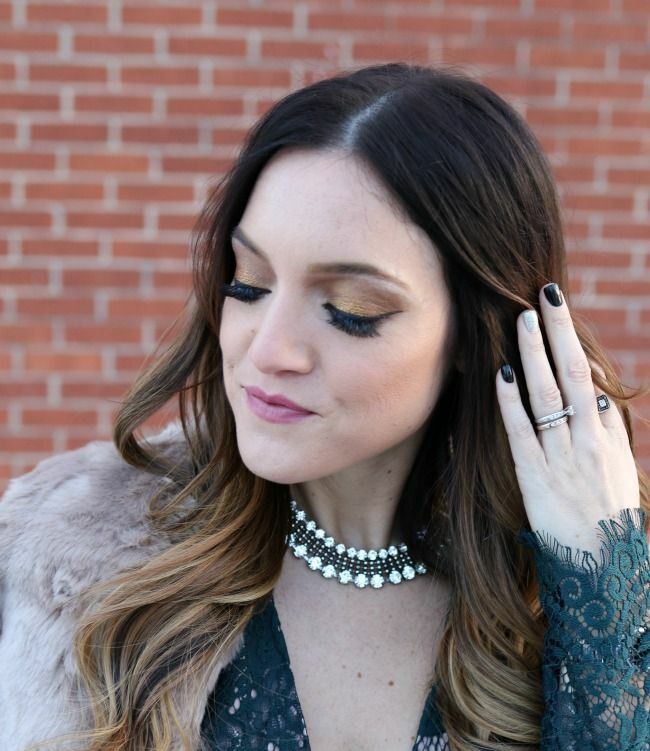 Since my makeup was super glam, I simply added a great necklace & my collarless faux fur jacket and the outfit was good to go. We found a new local restaurant that served seafood and steaks and we were off to celebrate. My hubby had an amazing day at work this day as well, so we had lots to be thankful for. Do you love the pairing of emerald and plum as much as I do? What do you think of this lace dress?